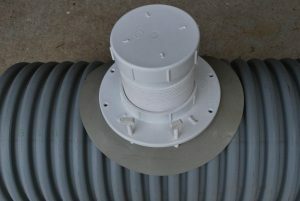 R&S Grating is now an authorised distributor of the Flowcon Conconect pipe adapter system. 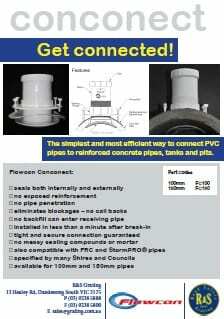 Conconect simplifies connecting PVC pipes to concrete pipes, tanks and pits. Eliminating the need for mortar and sealing compounds, Conconect facilitates fast connections with minimal labour. Furthermore, Conconect fully seals the connection, eliminating the risk of backfill entering the receiving pipe and the risk of blockages. R&S Grating stock Flowcon Conconect pipe adapters in 100mm (product code FC100) and 150mm (product code FC150) adapter size. R&S Grating offers the Conconect system at highly competitive prices. For more information, please visit Flowcon’s Website (www.flowcon.com.au).